Walloon Lake, located in Petoskey, Michigan. Where you will truly be up north in the most beautiful lake region ever. Here there is just about everything one could wish for to do in the outdoors. To live on this lake it does not come cheap, but if you are looking to buy a house there it could run you anywhere from 1.5 million to 5 million. Renting a house may be more in your budget and can average from $300 a night to $1500 a night. No matter how you get to Walloon Lake you will be in for a real treat. There are many trails that you can explore on. Hiking is an awesome way to spend your day. There are marked trails throughout Lake, Walloon. You can also look at Wood Maps of Wallon Lake to find places to hike. On different marked trails, you will know more of what to expect on each trail and find the one suited for your needs and what you are hoping to get out of your hike. Red trail has sloping hills. Blue trail is more challenging and rugged. Wildwood Harbor preserve is a marked trail featuring a small dock overlooking the north shore of Lake Evangline. Biking along these trails is something you may also want to consider. 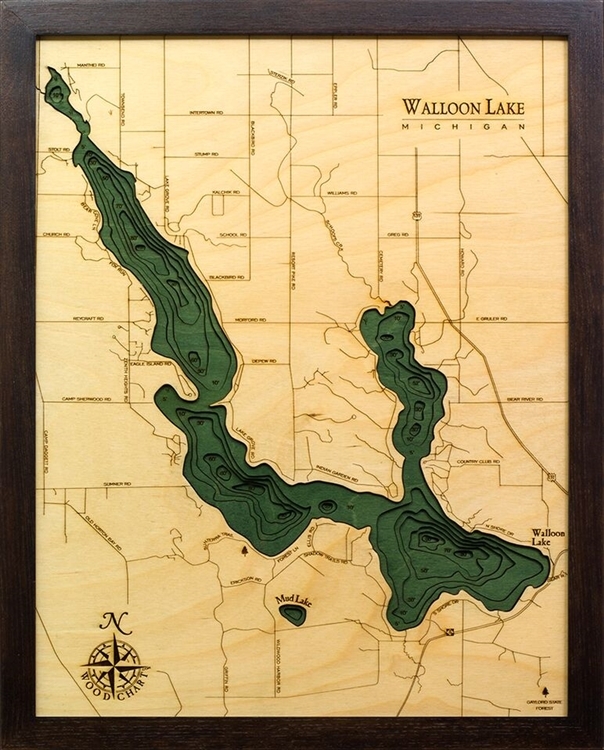 https://www.carvedlakeart.com/san-diego-wood-nautical-chart-map-p/sdgo-d3l.htm Check out carvedlakeart if you want the best deals on laser cut map, wood nautical chart in Walloon Lake MI, wood topographical map, and charts of the lakes, streams and oceans of the world. Birding is a great way to spend a relaxing afternoon. This is a great habitat for many forestry and animals. Different bird species flock to this habitat. On the Field Preserve you may be able to spot a Red Winged Blackbird, Bobolink, or a Barrel Owl. On the Cedar Valley Preserve you may have a potential sighting of a Wood Peewee, Ovenbird, Great Crested Fly Catcher or a Sandhill Crane. In the Cherry Lane Nature Area you are most likely to see a Wood Thrush, Veery or Ovenbird. If you want to explore Wildwood Harbour Preserve you might catch a glimpse of an American Redstart, Veery, Wood Peewee or various Wood Peckers. If you are a bird enthusiast, this is the place for you. If you like the water more kayaking or canoeing might be what you want. If you want to see the sights from the water this is a great way to do it. If you go on Stolt Road it will take you thru Mill Pond. Camp Sherwood Road will take you south of camp Michigan and Mackinaw State along the forest shoreline. A gorgeous sight to see at any time of year, but especially in the fall. With all the fall foliage, it is truly amazing. Maybe winter is the season you love? If so, this majestic place has plenty to offer. You can explore the woods and trails on snowshoes or cross country style. When the wetlands have frozen over the wet meadows and cedar swamps are truly amazing, almost taking you back in time. If hunting is your thing, then this is the place to be. Lake, Walloon has a lot to offer for this timeless tradition. It is controlled hunting, of course, during the regular hunting season and with a permit. Maybe boating is your passion. Of course boating is must here. Whether you bring your own boat or rent one here it is a fantastic adventure on the lake. Renting a boat could cost anywhere from $250 a day to upwards of $1000 per day. Great places to check out would be Boyne Recreational Rental or Walloon Central Power Sports and Marina. A favorite necessity of everyone is of course dinning. There are many great options for dining around this area. Barrel Back has lots of options for American cuisine. Walloon Lake Inn is great for fine dining. Walloon Village is a wonderful option for pizza and sandwiches. Café Sante is a good choice for those of you wanted a vegetarian option or a gluten free meal. Red Mesa Grill is there for those of you who would like Mexican. Julienne Tomatoes are great for up north hospitality serving up American cuisine along with great soups and salads. No matter what your passion is for the outdoors Lake, Walloon has it for you. Of course with all the outdoor adventures caution and safety are a must in all activities. So come on up north Michigan and visit Lake, Walloon for your family reunions, vacations, father son or mother daughter getaways. It is a great place for a girls or guys weekend or even if you just need somewhere to go along and get back to nature.